I'm going to say right at the outset of this blog post that I'm not an expert in this. But more and more I'm learning that we all need to do what we can to learn from those who are, to talk to others about what they have learned, to bravely make spaces in our classroom for difficult conversations. It won't be easy. But if not us, who? I love what Liz Kleinrock, an elementary school teacher who has been working for years to teach about equity to her elementary school students, says in her Ted Talk, "How to Teach Kids to Talk about Taboo Topics." "Teaching kids about equity in schools is not teaching them what to think. It is about giving them the tools, and strategies, and language and opportunities to practice how to think." As I've combed the web for resources and inspiration this week, I've been trying to find what will align with this vision. To help students consider, discuss, and learn from each other. To help them grapple with these big topics and understand what is going on and how they might play a role as informed allies and advocates, voters and parents and app-designers and CEOs. You'll know best which of the ideas and resources I'm going to share here are right for you and your classroom. I'm not suggesting you use all of them, but in this post I'm hoping you'll find one or two inroads. Some places to start in your classroom. I love what Bryan Stevenson (founder of the Equal Justice Initiative) says in his Ted Talk, "We Need to Talk about an Injustice." He pushes for Ted to pair the flashy worlds of innovation, technology, design and entertainment with care and compassion for all people, using their skills to make a difference in other people's lives. He talks about how identity and accomplishment are intertwined. His life's work has been to fight mass incarceration, the death penalty, and the sentence of life without parole for minors. And while he makes a powerful and important case for his own work, the Ted Talk is also about using your gifts in a way that shows you care about other people. What a powerful message to share. Of all the resources, Ted Talks, podcasts, websites, and Instagram accounts that I looked at this week, I'd say the gold standard resource online for confronting hate and talking about equity is Teaching Tolerance, an incredibly comprehensive and impressive website full of lesson plans, toolkits, podcasts, and curriculum to help you as you approach equity and inclusion in the classroom. Once you create a free account there, you can watch webinars, browse their video library, subscribe free to their magazine (which I did, and I hope you will too), and order film kits. 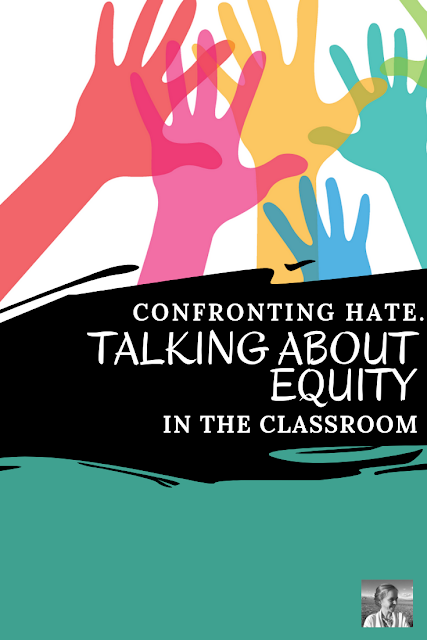 Download this poster from Teaching Tolerance for your classroom walls here. One of the easiest and most important ways that we can confront hate and promote equity in our classrooms is to bring more diverse voices into our curriculum and our independent reading libraries. Schools and departments fall in so many places on this. While one school makes The Hate U Give required reading for all students, another calls it too political and bans it as a curriculum option. That makes your position a little confusing. Are you just supposed to take whatever school policy is and go with it? Or can you help make a change where you are, if you feel change is needed? Push where you can. Be an upstander. 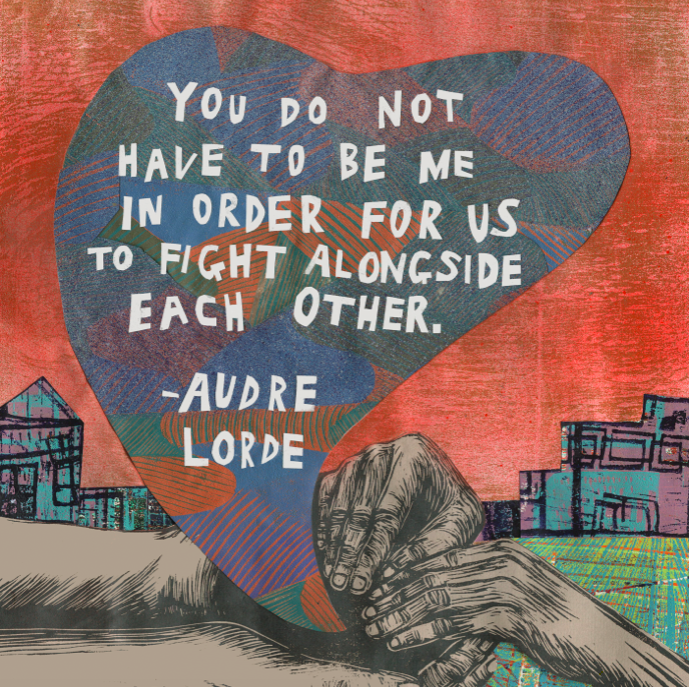 Advocate for more women and people of color in your text choices and on your shelves. And I'm not talking about just one woman and one person of color in a sea of white male authors. Remember Chimamanda Ngozi Adichie's Ted Talk, "The Danger of a Single Story." When you expose students to multiple perspectives, helping them to see many visions of other cultures and other races and other experiences, you give them a chance to develop a much more whole picture of the world. This week I've been reading Internment, by Samira Ahmed, in which she imagines a dystopia set in the very near future with Muslim-Americans interned as a supposed threat to the country. As so often happens for me, reading fiction made me more powerfully aware of reality. If you feel Islamaphobia is an issue at your school, check out the classroom resources from Teaching While Muslim This site provides a roundup of informational sources for learning more about Islamic history and culture, as well as links to specific lesson ideas like "Commemorate 9/11 by Combating Islamophobia." If you'd like to encourage students at your school to be more involved politically, you might consider starting a Youth Empower Chapter. This youth branch of the Women's March is all about empowering young people to make a difference in their communities. According to their website, "Young organizers can start Youth Empower Chapters all over the country. To date, there are over 200 youth-led Youth Empower Chapters, focusing on a range of issues from reproductive justice, racial justice and environmental justice to gun violence prevention, women’s rights, LGBTQ+ rights and more. Start a Youth Empower Chapter in your high school, college or community. Join a community of change-makers who are defining what they want this country to be, one chapter at a time." 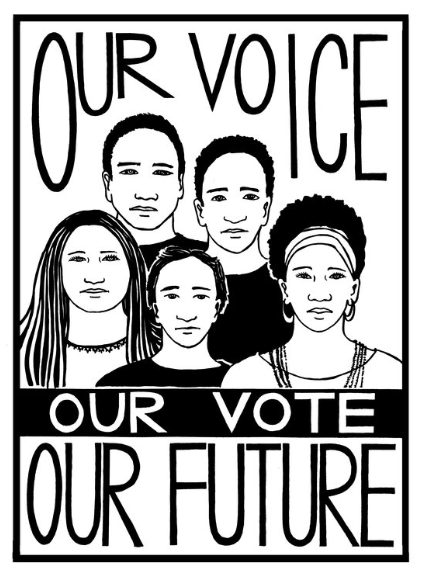 If you teach older students, you could also share the website Rock the Vote with them. Here they can register to vote, sign petitions, and contact elected officials. If you'd like to make your classroom walls reflect a vision of equity and empowerment, Radici Studios offers many beautiful images on its website as free downloads. You can also buy t-shirts, posters, and postcards, but below you'll see just two examples of images you could download and print as posters for your classroom. You choose the free downloads at the bottom of the store page and put them in your cart, but when you "checkout" all you do is share your email address. You don't even have to go to your inbox to get the images, they're ready to download right on the studio checkout page once you're done. A member of our Facebook group, Creative High School English, shared a powerful article with me this week that she plans to use while teaching Dear Martin. Consider reading Privileged, by Kyle Korver, with your students. It's about his experience as a white man in the NBA learning about race, equity and privilege. It's beautifully written and drives home some very big points. It reminds me of a somewhat more academic article that I read this week for myself as I did research for this article, Why It's so Hard to Talk to White People about Racism. 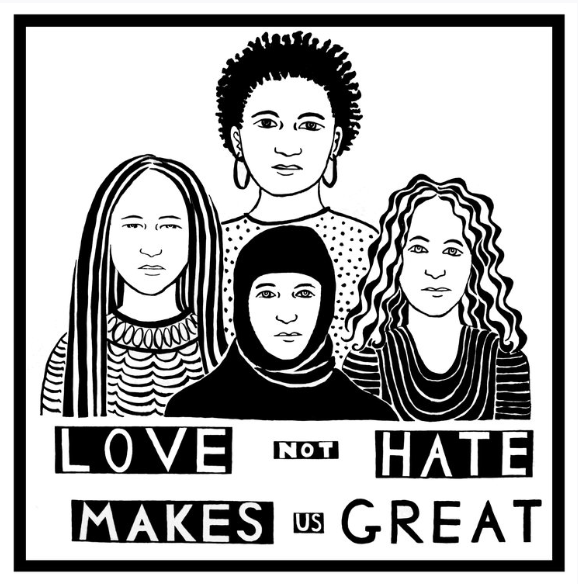 Another resource to consider is Teaching for Change , which has sections with ideas and information for teaching students about the Black Lives Matter movement, for challenging Islamophobia, for teaching about civil rights, for exposing students to more of the culture and literature of Central America, and more. If you are reading any stories, poetry, or literature set during genocide, you might examine Genocide Watch with your students and talk about the ten stages of genocide and how to recognize them. Or look at the levels in the Pyramid of Hate and reflect in writing. @Lovealltheblues recommended these great resources to me over on Instagram. The National Education Association's free Social Justice Lesson Plans feature the stories of the NEA Human and Civil Rights Awards recipients. 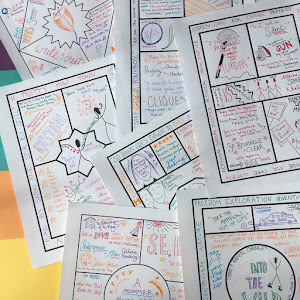 By spending a unit exploring the lives and actions of people and groups who have worked successfully in civil rights, students can begin to see types of actions that can make a difference and brainstorm what types of actions they might be able to take in their own lives. Or take a look at the online magazine "Let's Do This," from dosomething.org, "a global movement for good" that shares articles and ways for youth to get involved on a number of issues. These are just a handful of the possibilities out there. There is so much to learn. So much to talk about. So much listening to be done. But I hope this post will help. 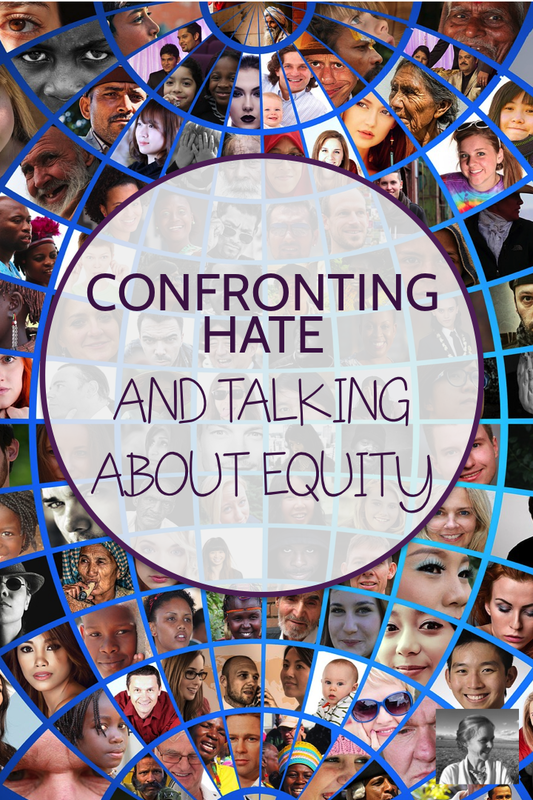 In the coming months, I'm looking forward to talking to an amazing librarian on the podcast about great texts to bring more diverse voices into our classroom reading, and to interviewing Liz Kleinrock about what she has learned in almost a decade teaching about equity with her students.